My brother Dan visited us from Austin, Texas this past week. We aren’t blood relatives– we are friends that understand we are siblings. I hadn’t seen him in almost 13 years. We had a blast. We discussed everything under the sun. We debated: Are celebrities deserving of sympathy for surrendering their right to privacy? I said: No. He said: Yes. Of course Kurt Cobain came up. I was told I was wrong (actually stronger language was used) for not liking Season 1 of True Detectives. That will likely turn out to be the case. Dan told me much the same about Tarantino’s Pulp Fiction. Of course he was right. Dan and his wife, Rosie, also adopted a child from foster care. They were a support to us during our trials in the system. He, Ward and I talked a lot about children most people would just as soon forget existed. Dan hires people with cognitive challenges. He pays them the same wage as people who don’t have have cognitive challenges. He wants all his employees to be encouraged to learn more. He thinks everyone is valuable. 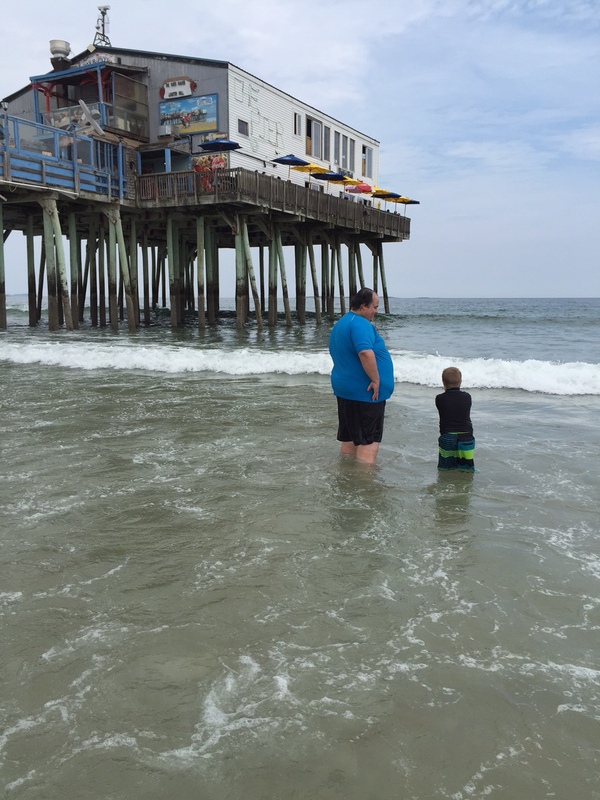 Dan & Thorin at Old Orchard Beach. Thorin was mesmerized by Dan. And the reverse appeared to be true. The first night Thorin lurked out in the kitchen pretending to do laundry but in actuality was checking out Dan from a far. After their first official meeting the next morning and through-out the visit Dan treated Thorin like any kid. He said that was in part from reading the blog. I think he would have anyway. Both Thorin and Dan worship Johnny Cash. So of course they had to sing together. You should check out Dan’s other videos. This entry was posted in Advocacy, By Notatypicalmom, Down syndrome, homeschooling, IDEA, Inclusion, Johnny Cash, life lessons, Ring of Fire and tagged advocacy, civil rights, Down syndrome, inclusion, Johnny Cash, notatypicalmom, Ring of Fire by Kari Wagner-Peck. Bookmark the permalink. Coolest guys ever…together! Love love loved watching the video. Thorin’s facial expressions and interpretive hand movements were so great. Fantastic. Thorin, Dan and Johnny Cash! Fantastic! Made my day! Thorin, you are a born showman. Thank y’all. Thorin was a joy. I love how he really gets into it after a bit. This was out second take. The first take had some quality antics but Thorin and I both thought it was worth a second take. They should take their act on the road! Thorin’s got a great sense of timing. I also love how demonstrative he is when he’s performing. …who wouldn’t want to have Dan for a brother! Thorin’s such a fortunate little boy. He’s so wonderfully privileged to have, what I call, the certainty of love. “the certainty of love.” YES! Really enjoyed this wonderful rendition of Rings of fire. Dan has a fine voice. Mr T is wonderfully expressive – brilliant! Sadly My Dan lives in Austin, TX:( Maybe road trip! He is an adorable little boy!may he always be so happy!